What is your plan for Break-up Season? So, Break-up Season is upon us. This means mucky, and unstable ground conditions, government road bans, and, depending on your situation, lots of free time. For some, this is an ideal time to relax, go on vacation, spend time with family, seek education, get recertified, and service; clean; and repair equipment. For some, they are lucky enough to either be employed or work for a company that is prepared for the challenges ahead. Although this time of year can be particularly difficult, specifically for any industry that relies on the transportation and operation of heavy vehicles and equipment, there is still a need for composite mats, access mats, rig mat washers and trucking services. At Little Guy Oil Field Rentals, we look to assist in any way we can. “The use of rig mats helps to reduce the impact of break-up season in areas not just in the oil and gas industry. We use rig mats on commercial and residential construction projects with the purpose of saving time and money for our own clients. With restrictions on city roads, specifically regarding the tracking of mud and rocks, rig mats have helped in keeping both our truck and roads clean while also allowing our sites to flow with little to no downtime.” – Shamus Dowler, President of PostMark Development Co.
For those who do not know, seasonal road bans are put in place during Break-up Season to prevent the creation of new potholes. As temperatures start to rise, the roads become soft and susceptible to cracks and damage. As this freeze-thaw-cycle continues, water and moisture seeps through these cracks and is soaked into the soil that makes up the road bed. As night falls, so too does the temperature, freezing and expanding the soaked water below, forming ice. Later the next day, the ice melts and evaporates, leaving a hollow cavity beneath the road. Over time, the asphalt breaks away, falling into the hollow cavity, creating a new pothole. Obviously, without these road bans, our roads and highways would be riddled with potholes, or worse, as a direct result of the seasons changing. In this case, more government time and resources would be required to fill and repair these holes. Unless otherwise suggested, say with a permit, highway transportation during this time is out. Although a difficult challenge, not an impossible one. Off-road transportation is still a viable option, however, given that the ground is soft, wet and muddy, you run the risk of getting stuck or otherwise damaging your vehicles and equipment. Not to mention the risk of encountering muskeg which, as you may already know, can easily resemble solid ground. Dirt and gravel roads are also viable options; they are, however, still as susceptible to Break-up Season as everything else. If looking to pursue off-road means, there are various options available to allow for safe and stable transportation. 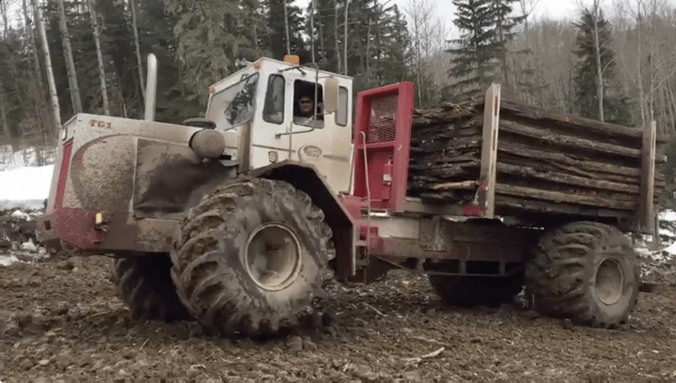 The use of low ground pressure tiresis an option, these would allow for travel over areas that are soft, loose and wet, through muskeg, swamps and wetlands. Our Mat Runner utilizes similar means by using low pressure, high volume tires. Another, would be to build temporary roadways that allow for the transportation and operation of heavy vehicles and equipment in similar areas. This can be done with Rig, Access, Rubber or Composite Mats, depending on the environment and your situation. Whether we like it or not, Break-up Season is here. For those taking time off, going on vacation or otherwise taking a break, enjoy, you have certainly earned it. Those who are pushing through, we commend your efforts, and we wish you luck. Those of you still in the field; still having to deal with the rapidly deteriorating conditions, now is the time to secure your access mats for the rough season ahead. We are looking at a longer wetter Spring this year, as compared to previous years, and this will only compound the challenges and shortages.